I'm a proud momma of two gorgeous babies; Miina and Moses. I know, we should've gotten cat from the shelter to save some poor thing's life and we did go to few of those. We almost adopted this little black kitty from the Liberty Humane Society in Jersey City called Piglatin. We filled out all the adoption papers, she was getting checked by the animal shelter vet and we were obtaining all the documents they asked from us, like permission from our apartment management company saying we were allowed to have animals in this community (we weren't, but my husband used to go to school with one of the girls that worked in the management office and she wrote us a letter). Then few days before we were allowed to go and picked Piglatin up and take her home, the shelter called and said that Piglatin had some kind of incurable disease that required medication and daily care taking. .We were heartbroken, but went back to the shelter after few weeks to see our other options. And there we saw her again, poor little Piglatin. She was just sitting there and her eyes were completely messed up and she looked like she was in very bad shape. I felt so bad for her and guilty so we left and stopped looking for our companion for quite a long time. .Not until we ventured out to country side in Pennsylvania on one of our weekend road trips. My husband remembered that his sister had gotten her 2 cats from a lady who lived in this ranch with horses and bunch of other animals and we could go visit and see them. So we did. And that’s where we saw our babies; we just knew that was it. We had to wait few weeks before they were old enough to be separated from their mom. That was one long wait. Since we brought the babies home life hasn’t been the same. It’s been so much better, happier, loving, snuggly. I got lot of attention to give to many directions and making sure one doesn’t get more than the other one, because otherwise I’m going to hear about it or get an attitude. Miina especially is very sensitive to this and I got to be very careful not to hurt her feelings or do her wrong in any way. Where ever I go in the house now I get no privacy and I have a fan club following me. I’m never alone which is really nice if you’re that type. Besides its stunning, intelligent blue eyes and the gorgeous two-toned coat, a distinctive feature of this breed is that it has a very loud and distinctive low pitch to its voice. 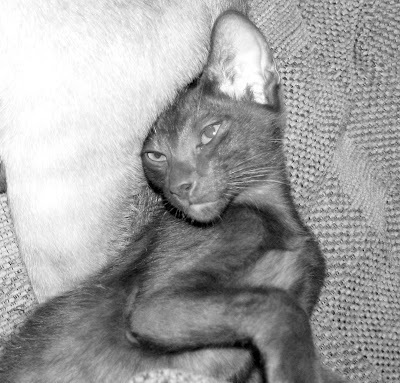 The Siamese meow has been compared to the cries of a human baby. The intensity of the vocalization should not be prolonged if you are smart enough to understand what they want. 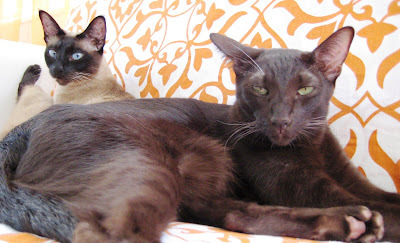 Most of the time the Siamese will talk at conversational levels, and they always have something very important to say. So the Siamese cat personality is very talkative. In the hierarchy of cat intelligence, the Siamese stands on top. 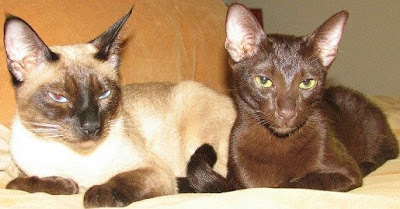 It has been indicated that Siamese and other oriental shorthairs are the most intelligent of all domesticated cats. Anyone who has owned one will boast on tales and the amazing feats that these cats can accomplish. 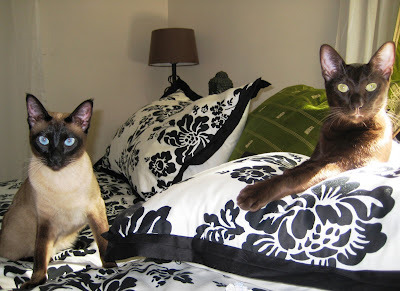 You may want to “cat-proof” your home for a Siamese can learn how to open doors, cabinets, and latches. Actually these cats love the challenge of these feats, and will not give up. They find creative and unusual ways to get into trouble. Because of their intelligence, they are very lively and entertaining. The Siamese cat can be very demanding. These cats become totally involved in their owner’s life. 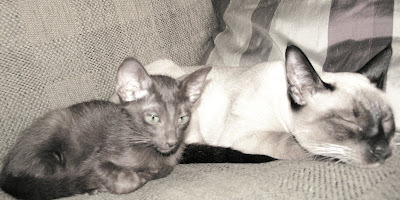 The Siamese are typically active and playful, even as adults. 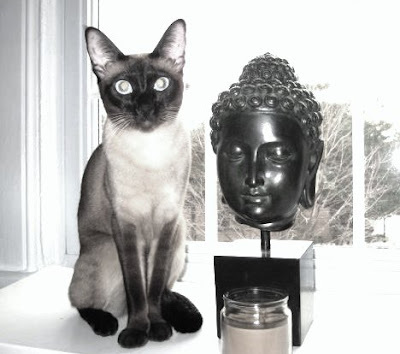 Siamese do not like to be ignored and always want to be the center of attention. They regard themselves as people instead of cats. 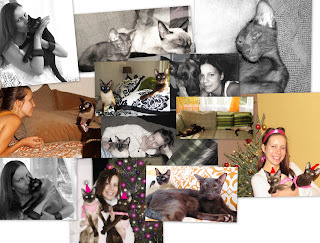 One thing for sure, you will never be bored if you own a Siamese cat.